The Brihadaranyaka Upanishad (Sanskrit: बृहदारण्यक उपनिषद्, Bṛhadāraṇyaka Upaniṣad) is one of the Principal Upanishads and one of the oldest Upanishadic scriptures of Hinduism. A key scripture to various schools of Hinduism, the Brihadaranyaka Upanisad is tenth in the Muktikā or "canon of 108 Upanishads". The Brihadaranyaka Upanishad is estimated to have been composed about 700 BCE, excluding some parts estimated to have been composed after the Chandogya Upanishad. The Sanskrit language text is contained within the Shatapatha Brahmana, which is itself a part of the Shukla Yajur Veda. The Brihadaranyaka Upanishad is a treatise on Ātman (Soul, Self), includes passages on metaphysics, ethics and a yearning for knowledge that influenced various Indian religions, ancient and medieval scholars, and attracted secondary works such as those by Madhvacharya and Adi Shankara. The chronology of Brihadaranyaka Upanishad, like other Upanishads, is uncertain and contested. The chronology is difficult to resolve because all opinions rest on scanty evidence, an analysis of archaism, style and repetitions across texts, driven by assumptions about likely evolution of ideas, and on presumptions about which philosophy might have influenced which other Indian philosophies. Patrick Olivelle states, "in spite of claims made by some, in reality, any dating of these documents (early Upanishads) that attempts a precision closer than a few centuries is as stable as a house of cards". The chronology and authorship of Brihadaranyaka Upanishad, along with Chandogya and Kaushitaki Upanishads, is further complicated because they are compiled anthologies of literature that must have existed as independent texts before they became part of these Upanishads. The exact year, and even the century of the Upanishad composition is unknown. Scholars have offered different estimates ranging from 900 BCE to 600 BCE, all preceding Buddhism. Brihadaranyaka is one of the oldest Upanishads, along with that of Jaiminiya Upanishad and Chandogya Upanishads. The Brihadaranyaka Upanishad was in all likelihood composed in the earlier part of 1st millennium BCE, around 700 BCE, give or take a century or so, according to Patrick Olivelle. It is likely that the text was a living document and some verses were edited over a period of time before the 6th century BCE. 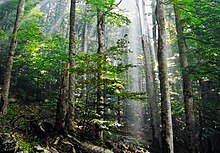 Brihadaranyaka Upanishad literally means the "Upanishad of the great forests". The title Brihadaranyaka Upanishad literally means "great wilderness or forest Upaniṣhad". It is credited to ancient sage Yajnavalkya, but likely refined by a number of ancient Vedic scholars. The Upanishad forms the last part, that is the fourteenth kānda of Śatapatha Brāhmana of "Śhukla Yajurveda". The Brihadaranyaka Upanishad has six adhyayas (chapters) in total. There are two major recensions for the text - the Madhyandina and the Kanva recensions. It includes three sections: Madhu kānda (the 4th and 5th chapter of the fourteenth kānda of Satapatha Brahmana), Muni kānda (or Yajnavalkya Kanda, the 6th and 7th chapter of 14th kānda of Satapatha Brahmana) and Khila kānda (the 8th and 9th chapter of the fourteenth kānda of Satapatha Brahmana). The first and second chapters of the Upanishad's Madhu kānda consists of six brahmanams each, with varying number of hymns per brahmanam. The first chapter of the Upanishad's Yajnavalkya kānda consists of nine brahmanams, while the second has six brahmanams. The Khila kānda of the Upanishad has fifteen brahmanams in its first chapter, and five brahmanams in the second chapter. The Brihadaranyaka Upanishad starts by stating one of many Vedic theories of creation of the universe. It asserts that there was nothing before the universe started, then Prajapati created from this nothing the universe as a sacrifice to himself, imbued it with Prana (life force) to preserve it in the form of cosmic inert matter and individual psychic energy. The world is more than matter and energy, asserts Brihadaranyaka, it is constituted also of Atman or Brahman (Soul, Self, Consciousness, Invisible Principles and Reality) as well as Knowledge. The Brahmana 4 in the first chapter, announces the Upanishad's non-dual, monistic metaphysical premise that Atman and Brahman are identical Oneness, with the assertion that because the universe came out of nothingness when the only principle existent was "I am he", the universe after it came into existence continues as Aham brahma asmi (I am Brahman). In the last brahmana of the first chapter, the Upanishad explains that the Atman (soul) inspires by being self-evident (name identity), through empowering forms, and through action (work of a living being). The Soul, states Brihadaranyaka, is the imperishable one that is invisible and concealed pervading all reality. The Brihadaranyaka Upanishad starts the second chapter as a conversation between Ajatashatru and Balaki Gargya on theory of dreams, positing that human beings see dreams entirely unto themselves because mind draws, in itself, the powers of sensory organs, which it releases in the waking state. It then asserts that this empirical fact about dreams suggests that human mind has the power to perceive the world as it is, as well as fabricate the world as it wants to perceive it. Mind is a means, prone to flaws. The struggle man faces, asserts Brihadaranyaka in brahmana 3, is in his attempt to realize the "true reality behind perceived reality". That is Atman-Brahman, inherently and blissfully existent, yet unknowable because it has no qualities, no characteristics, it is "neti, neti" (literally, "not this, not this"). In fourth brahmana, the Upanishad presents a dialogue between a husband and wife, as Yajnavalkya and Maitreyi, on nature of love and spirituality, whether and how is Atman related to deep connection and bonds between human beings. Yajnavalkya states that one doesn't connect with and love forms, nor does one connect or love mind, rather one connects with the Self, the Soul of one's own and one's beloved. All love is for the sake of one's Self, and the Oneness one realizes in the Self of the beloved. He then asserts that this knowledge of the Soul, the Self, the Brahman is what makes one immortal, the connection immortal. All longing is the longing for the Soul, because Soul is the true, the immortal, the real and the infinite bliss. The fifth brahmana of the second chapter introduces the Madhu theory, thus giving this section of the Upanishad the ancient name Madhu Khanda. The Madhu theory is one of the foundational principles of Vedanta schools of Hinduism, as well as other āstika schools of Indian philosophies. Madhu literally means "honey", or the composite fruit of numerous actions on the field of flowers. In the Madhu theory, notes Paul Deussen, the Brihadaranyaka Upanishad asserts that "Atman exists" (soul exists), that all organic beings (plants, animals, human beings and gods) are wandering souls yet One with each other and the Brahman (Cosmic Soul); it further asserts that inorganic nature (fire, air, earth, water, space) is the field where the beings act, and where their numerous actions create fruits that they separately and together experience. The Upanishad then states that everything is connected, beings affect each other, organic beings affect the inorganic nature, inorganic nature affects the organic beings, one is the "honey" (result, fruit, food) of the other, everyone and everything is mutually dependent, nourishing and nurturing each other, all because it came from one Brahman, because it is all one Brahman, because all existence is blissful oneness. This theory appears in various early and middle Upanishads, and parallels Immanuel Kant's doctrine of "the affinity of phenomena" built on "the synthetic unity of apperception". The last brahmanam of the Upanishad's first section is a Vamsa (generational line of teachers) with the names of 57 Vedic scholars who are credited to have taught the Madhu Khanda from one generation to the next. The third chapter is a metaphysical dialogue between ten ancient sages, on the nature of Reality, Atman and Mukti. Paul Deussen calls the presentation of ancient scholar Yajnavalkya in this chapter "not dissimilar to that of Socrates in the dialogues of Plato". Among other things, the chapter presents the theory of perceived empirical knowledge using the concepts of graha and atigraha (sensory action and sense). It lists 8 combinations of graha and atigraha: breath and smell, speech and name (ideas), tongue and taste, eye and form, ear and sound, skin and touch, mind and desire, arms and work respectively. The sages debate the nature of death, asserts the third chapter of Brihadaranyaka Upanishad, and whether any graha and atigraha prevails after one dies. They rule out six, then assert that one's ideas (name) and one's actions and work (karma) continues to affect the universe. The fourth brahmana of the third chapter asserts, "it is your soul which is inside all", all souls are one, immanent and transcendent. The fifth brahmana states that profound knowledge requires that one give up showing off one's erudition, then adopt childlike curiosity and simplicity, followed by becoming silent, meditating and observant (muni), thus beginning the journey towards profound knowledge, understanding the soul of things where there is freedom from frustration and sorrow. In the sixth and eighth brahmana of the third chapter in Brihad Aranyaka Upanishad is the dialogue between Gargi Vachaknavi – the female Vedic sage, and Yajñavalka, on the nature of universe. The seventh brahmana discusses how and why the soul interconnects and has the oneness through all organic beings, all inorganic nature, all of universe. It asserts that the soul is the inner controller of beings, conflated with the interaction of nature, psyche and senses, often without the knowledge of beings. It is the soul, nevertheless, that is the true and essence, states the Upanishad. The ninth brahmana, the longest of the third chapter, introduces the "neti, neti" principle that is discussed later, along with the analogical equivalence of physical features of a man and those of a tree, with the root of a man being his soul. The last hymns of chapter 3 in Brihadaranyaka Upanishad also attest to the prevalent practice of the renouncing ascetic life by the time Brihadaranyaka Upanishad was composed in Vedic age of India, and it is these ascetic circles that are credited for major movements such as Yoga as well as the śramaṇa traditions later to be called Buddhism, Jainism and heterodox Hinduism. when he is struck down by death? and also of one who stands away (renounces) and knows it. The fourth chapter of Brihadaranyaka Upanishad starts as a dialogue between King Janaka and Yajnavalka. It explores various aspects of the "Soul exists" theory, its phenomenal manifestations, and its philosophical implications on soteriology. The Upanishad, in the first brahmanam of fourth chapter, states that the soul manifests in human life in six forms: Prajna (consciousness), Priyam (love and the will to live), Satyam (reverence for truth, reality), Ananta (endlessness, curiosity for the eternal), Ananda (bliss, contentness), and Sthiti (the state of enduring steadfastness, calm perseverance). In the second brahmanam, the Upanishad explores the question, "what happens to soul after one dies? ", and provides the root of two themes that play central role in later schools of Hinduism: one, of the concept of soul as individual souls (dualism), and second of the concept of soul being One and Eternal neither comes nor goes anywhere, because it is everywhere and everyone in Oneness (non-dualism). This chapter discusses the widely cited "neti, neti" (नेति नेति, "not this, not this") principle towards one's journey to understanding soul. The second brahmanam concludes that soul exists is self-evident, soul is blissfully free, soul is eternally invulnerable, and soul is indescribable knowledge. The hymn 4.2.4 of Brihadaranyaka Upanishad is one of many instances in the ancient Sanskrit text where the characters involved in philosophical debate greet each other with Namaste (नमस्ते), a practice in the culture of India. the worlds not worlds, the gods not gods, the Vedas not Vedas. a Sramana not a Sramana, a Tâpasa not a Tâpasa. for he has then overcome all sorrows, all sufferings. Thus did Yâgñavalkya teach him. this is his highest Bliss. The fourth brahmanam continues to build the thematic description of Atman-Brahman (Self, Soul) and the state of self-realization as achieved. Yajnavalkya declares that Knowledge is Self, Knowledge is freedom, Knowledge powers inner peace. In hymn 4.4.22, the Upanishad states, "He is that great unborn Self, who consists of Knowledge, is surrounded by the Prânas (life-force), the ether within the heart. In it [Soul] there reposes the ruler of all, the lord of all, the king of all. He does not become greater by good works, nor smaller by evil works. He is the lord of all, the king of all things, the protector of all things. He is a bank and a boundary, so that these worlds may not be confounded. He who knows him [soul], becomes a Muni. Wishing for that world, mendicants leave their homes." Max Müller and Paul Deussen, in their respective translations, describe the Upanishad's view of "Soul, Self" and "free, liberated state of existence" as, "[Self] is imperishable, for he cannot perish; he is unattached, for he does not attach himself; unfettered, he does not suffer, he does not fail. He is beyond good and evil, and neither what he has done, nor what he has omitted to do, affects him. (...) He therefore who knows it [reached self-realization], becomes quiet, subdued, satisfied, patient, and collected. He sees self in Self, sees all as Self. Evil does not overcome him, he overcomes all evil. Evil does not burn him, he burns all evil. Free from evil, free from spots, free from doubt, he became Atman-Brâhmana; this is the Brahma-world, O King, thus spoke Yagnavalkya." The last brahmanam of the Upanishad's second section is another Vamsa (generational line of teachers) with the names of 59 Vedic scholars who are credited to have taught the hymns of Muni Khanda from one generation to the next, before it became part of Brihadaranyaka. The fifth and sixth chapters of Brihadaranyaka Upanishad are known as Khila Khanda, which literally means "supplementary section, or appendix". Each brahmanam in the supplement is small except the fourteenth. This section, suggests Paul Deussen, was likely written later to clarify and add ideas considered important in that later age. Some brahmanams in the last section of Brihadaranyaka Upanishad, such as the second and third brahmanam in fifth chapter, append ethical theories, while fourth brahmanam in the fifth chapter asserts that "empirical reality and truth is Brahman". In the fourth brahmanam of sixth chapter, sexual rituals between a husband and wife are described to conceive and celebrate the birth of a child. The Brihadaranyaka text has been an important Upanishad to the Vedanta scholars, and discusses many early concepts and theories foundational to Hinduism such as Karma, Atman and others. The Brihadaranyaka Upanishad includes hymns on virtues and ethics. In verse 5.2.3, for example, it recommends three virtues: self-restraint (दमः, Damah), charity (दानं, Daanam), and compassion for all life (दया, Daya). Learn three cardinal virtues – temperance, charity and compassion for all life. According as one acts, so does he become. Ancient and medieval Indian scholars have referred to Brihadaranyaka Upanishad as a foundation to discuss psychological theories, the nature of psyche, and how body, mind and soul interact. For example, Adi Shankara in his commentary on the Brihadaranyaka Upanishad explains the relation between consciousness, the mind and the body. Mind creates desire, asserts Brihadaranyaka Upanishad, with its basis in pleasure. Eye is the cause of material wealth, because it is through sight that wealth is created states the Upanishad, while ears are spiritual wealth, because it is through listening that knowledge is shared. The Upanishad suggests in the dialogue between Yajnavalkya and Maitreyi, husband and wife, that one does not love an object for the sake of the object but for the sake of the subject, the Self (the soul of the other person). Verse 1.3.28 acknowledges that metaphysical statements in Upanishads are meant to guide the reader from unreality to reality. The metaphysics of Brihadaranyaka Upanishad is non-dualism (Advaita). For instance, in verse 2.4.13 Yajnavalkya asserts that everything in the universe is the Self. The nature of reality or Self is described as consciousness-bliss in verse 3.9.28. Neti-neti or (not this—not this) is a method of emphasizing the discovery of the right, by excluding the wrong. The verse 5.1 states that the Universe, Reality and Consciousness is infinite. pūrṇasya pūrṇam ādāya pūrṇam evāvaśiṣyate. "That (Brahman) is infinite, and this (universe) is infinite. the infinite proceeds from the infinite. (Then) taking the infinitude of the infinite (universe), it remains as the infinite (Brahman) alone." "From infinite or fullness, we can get only fullness or infinite". The above verse describes the nature of the Absolute or Brahman which is infinite or full, i.e., it contains everything. Upanishadic metaphysics is further elucidated in the Madhu-vidya (honey doctrine), where the essence of every object is described to be same to the essence of every other object. The Brihadaranyaka Upanishad looks at reality as being indescribable and its nature to be infinite and consciousness-bliss. The cosmic energy is thought to integrate in the microcosm and in the macrocosm integrate the individual to the universe. The Brihadaranyaka Upanishad has attracted secondary literature and commentaries (bhasya) from many scholars. In these secondary texts, the same passages have been interpreted in different ways by the various sub-schools of Vedanta such as nondualistic Advaita (monism), dualistic Dvaita (theism) and qualified nondualistic Vishistadvaita. Albrecht Weber, The Çatapatha-Brāhmaṇa in the Mādhyandina-Çākhā, with extracts from the commentaries of Sāyaṇa, Harisvāmin and Dvivedānga, Berlin 1849, reprint Chowkhamba Sanskrit Ser., 96, Varanasi 1964. Sivananda Saraswati, The Brihadaranyaka Upanishad: Sanskrit text, English translation, and commentary. Published by Divine Life Society, 1985. Radhakrishnan, Sarvepalli (1994) . The Principal Upanishads. New Delhi: HarperCollins Publishers India. ISBN 81-7223-124-5. Poet T. S. Eliot makes use of the story "The Voice of the Thunder" and for the source of "datta, dayadhvam, and damyata" found in the Brihadaranyaka Upanishad. Sections of the story appear in his poem The Waste Land under part V What The Thunder Said. ^ Jonardon Ganeri (2007). The Concealed Art of the Soul: Theories of Self and Practices of Truth in Indian Ethics and Epistemology. Oxford University Press. pp. 13–14. ISBN 978-0-19-920241-6. ^ Patrick Olivelle (1998). Upaniṣads. Oxford University Press. pp. xxxvi–xxxvii. ISBN 978-0-19-283576-5. ^ Eugene F. Gorski (2008). Theology of Religions: A Sourcebook for Interreligious Study. Paulist. pp. 103 note 15. ISBN 978-0-8091-4533-1. , Quote: "It is therefore one of the oldest texts of the Upanishad corpus, possibly dating to as early as the ninth century BCE". ^ Jones, Constance (2007). Encyclopedia of Hinduism. New York: Infobase Publishing. p. 93. ISBN 0816073368. ^ Gopal, Madan (1990). K.S. Gautam (ed.). India through the ages. Publication Division, Ministry of Information and Broadcasting, Government of India. p. 80. ^ Geoffrey Samuel (2008), The Origins of Yoga and Tantra, Cambridge University Press, ISBN 978-0521695343, page 8, Quote: such (yogic) practices developed in the same ascetic circles as the early śramaṇa movements (Buddhists, Jainas and Ajivikas), probably in around the sixth or fifth BCE. ^ Hans Torwesten (1994). Vedanta: Heart of Hinduism. Grove. pp. 55–57. ISBN 978-0-8021-3262-8. ^ Chatterjea, Tara. Knowledge and Freedom in Indian Philosophy. Oxford: Lexington Books. p. 148. ^ Swami Madhavananda. The Brhadaranyaka Upanisad with commentary of Sankaracarya. ^ Wendy Doniger (1988). Textual Sources for the Study of Hinduism. Manchester University Press. pp. 39–44. ISBN 978-0-7190-1866-4. ^ Madhva (1999). The Principal Upaniṣads: Chandogya-Brihadaranyaka. Dvaita Vedanta Studies and Research Foundation. pp. i–iv. ^ Bloom, Harold (2006). T.S. Eliot's The Waste Land. New York: Infobase Publishing. p. 58.